Located next to world heritage Hoi An and the world biosphere reserve Cham Islands, Cam Thanh coconut village is a popular tourist attraction, hosting thousands of foreign visitors every summer. 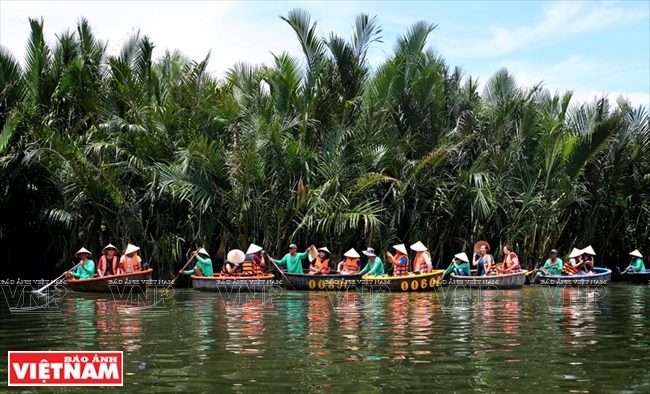 Around three kilometers away from Hoi An, the immense Cam Thanh coconut forest, regarded as the green lung of Hoi An, is almost a miniature of the Mekong river delta. The only difference between them is perhaps the means of transport used. In the Mekong delta, one travel s on three-plank wooden boats while in Cam Thanh, visitors use basket boats (thung chai) to go to the coconut forest. The pleasure of sitting in a basket boat weaving under coconut trees and seeing the beautiful scenery of a rural water region makes visitors feel attached to this place. The coconut forest has been growing for 200 years. The variety of coconut, which was brought by southwestern immigrants, perfectly fit the favorable soil and water conditions of the central region. From only a few hectares, the coconut trees have naturally grown into a forest with a total area of over 100 hectares. 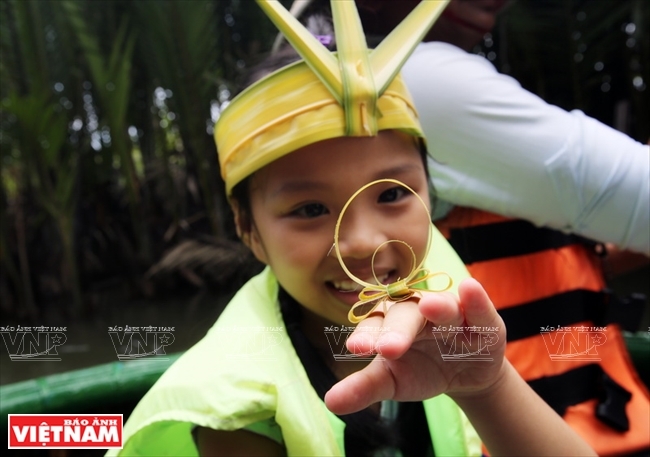 For generations, the coconut forest, which is home to numerous aquatic species, has protected Cam Thanh villagers from waves from the sea and safeguarded the world biosphere reserve Cham Islands. 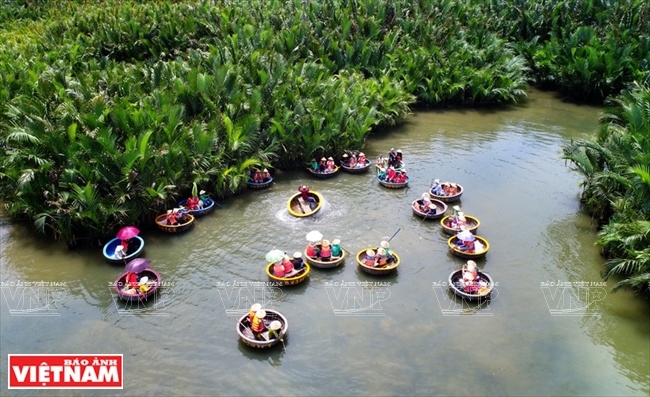 Just for VND 150,000 (roughly USD 7), one can rent a basket boat for two visitors with a friendly boatman to discover the wild beauty of the coconut forest. Two hours in the basket boat rowing through small channels under green coconut trees, visitors will experience the pleasure of listening to sweet folksongs sung by the boat rower and seeing locals catching fish and crab. They will enjoy the adventure of sitting in the constantly swinging and shaking basket boat skillfully rowed by the boatman. Visitors will have to hold tightly to the boat to avoid falling out of it, which gives both fear and excitement. According to Do Van Tien, a member of the basket boat team, his village, Van Thanh, alone has over 300 basket boats. 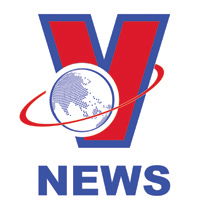 In summer, the village may host a thousand visitors who come mostly from South Korea, China and some European countries. After the journey to discover the wild coconut forest, visitors can stay at the wharf, enjoying coconut milk and watch the whole immense water area with green coconut forests. This peaceful scene gives a sense of relaxation visitors can never forget as well as a desire to come back.